UK Snow: Where Did My Hometown Go? I just saw this stunning image on Phil Plait’s Bad Astronomy and I assumed it was a fancy bit of art… or a computer generated view of glacial Britain… or UK-shaped frosted cake. Nope, it’s the UK as it looks from space, right now. The UK is experiencing record low temperatures and I just got off the phone to my mum to hear that Bristol (my hometown, somewhere in the south-west of England) hit a bone shattering -15°C low last night. Yikes! And here I am looking out of my office window feeling the heat of the Sun of a 24°C California day. Truth be told, I’m a little jealous, I haven’t felt sub zero cold for years. In fact, the last time I saw negative temperatures in double figures was when I lived in the Arctic in 2002. For now, I’ll just have to enjoy the view from space and hope this cold spell doesn’t cause too much hassle for my family and friends. My advice: Stay indoors, only go outside if you have a warm local pub within walking distance. 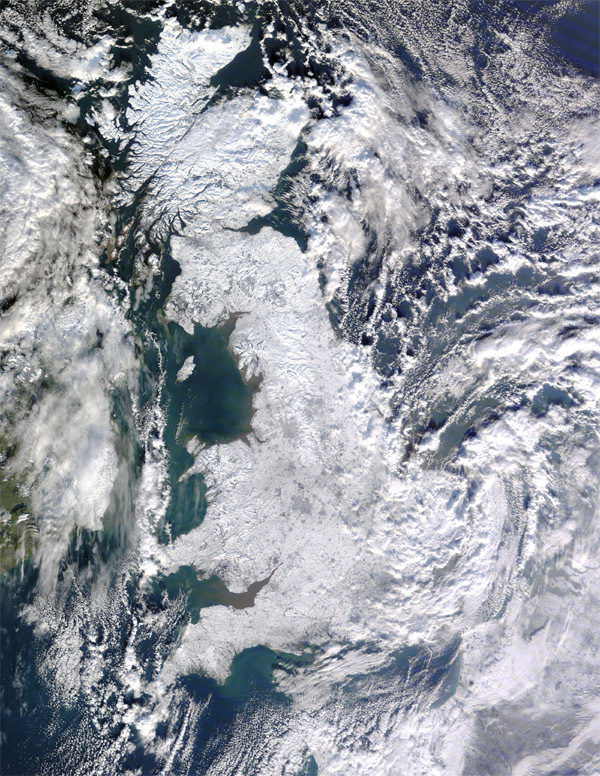 Interestingly, nearly a year ago, I was admiring views taken by the same Terra satellite of the British Isles of the snow fall back then. Needless to say, this year is worse, far worse (but a lot prettier). Holy crap. I've never seen snow more than a foot deep in real life. At least the kids are having fun. You certainly place a new turn on a topic that’s been on paper about for years. I have been searching for some information about it almost three hours. I’m still waiting for some interesting thoughts from your side in your next post. This is the ideal post for someone who desires to be familiar with this subject, and I love the way you blog. I included it to my favorites blog site list and will also be checking quickly. with us in future too.